Yesterday, I visited an exhibit called “Bible Through History: From the Dead Sea to the Moon.” Aside from what struck me as the curator’s dubious claims that the content of the first four chapters of Genesis has been preserved in its original cuneiform transcription; “proof” that the Bible is the inerrant word of God because someone identified two identical manuscripts of Isaiah 8 separated by nearly 2000 years; painstaking emphasis on the contributions to the Christian faith by dead white men; and the fact that the “Bible Museum” which provided the artifacts is actually a rare book vendor that will sell you individual pages dissected from otherwise priceless folios, the exhibit was outstanding. As a librarian, I tend to get weak in the knees in the presence of rare manuscripts. I just about passed out the first time I saw a copy of the Magna Carta and I actually cried in front of the Declaration of Independence. And the space between matched displays of a Gutenberg Bible and the Giant Bible of Mainz in the Library of Congress feels to me like entering the Holy of Holies. That’s how it felt yesterday, gazing awestruck through a simple Plexiglas case containing three early editions of the Geneva Bible. 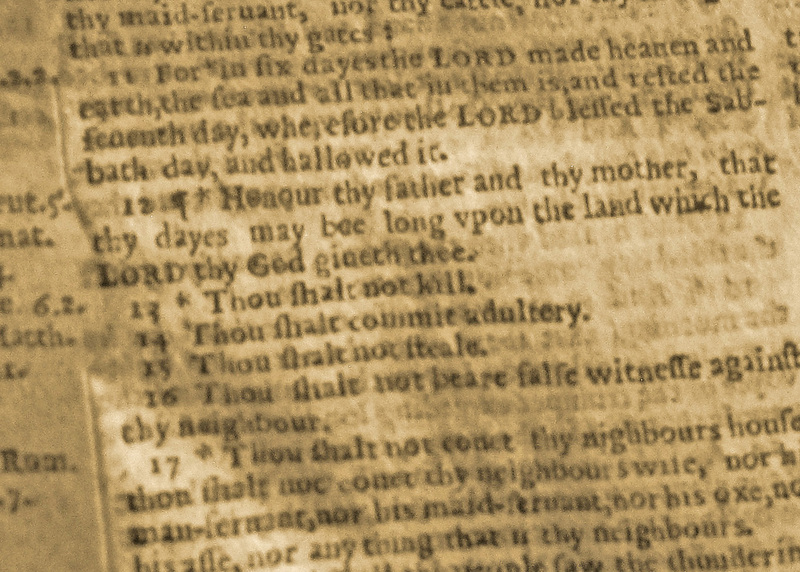 I hovered over a first edition King James Bible the size of my dining room table and marveled at the scrupulous calligraphy text in a Wycliffe bible. A first edition of Erasmus’ Greek translation of the New Testament made an appearance, as did several bound collections of Calvin’s and Luther’s sermons. And then…there was the Wicked Bible. The Archbishop and the king both pretty much lost their minds over this, ordered all copies burnt, fined Barker and Lucas 300 pounds sterling, and revoked their printers license. The message being that you’d better not screw up the inerrant and invariable Word of God. Here’s the rub, though. From where I’m sitting, the Bible can’t simply be the inerrant and invariable Word of God because God’s grace and outrageous sense of humor has given us the means to work with it. To read it, study it, contemplate it, copy it, translate it, and yes, mess with it. The Bible is, or should be, a dynamic, living communication medium between human beings and God. The Bible is not, and should never be, a megaphone. It is a conversational medium, like a telephone. God could spend a lot of time just blasting out announcements on some super spiritual PA system, but God wants to engage us. So, God holds one tin can at the end of the string and we hold the other. And, like it or not, as soon as we get our hands on that receiver, we get our messy fingerprints all over it. News flash: God knows we have fingerprints. God created them. God knows that communiques between pure spirit and spirit-in-flesh entail a certain measure of inevitable static. Those of us who spend any time at all endeavoring to pray encounter this problem much of the time. We can’t think of what to say, we stumble over what we do say, and we sit in agitated silence straining to hear some murmur to assure us that we’re not engaged in monologue. The thing that makes prayer relational, and not incantational, is the expectation of some kind of spiritual rendezvous on both sides. It is not the prayer itself that makes the connection; it’s the practice of prayer. Similarly, the practice of engaging sacred text, not the sacred text itself, makes a book like the Bible a powerful mechanism for relating to the divine. Martin Luther said that the Bible on paper is just a book; the influence of God in our reading of the book transforms it into the “Word.” And if our understanding of the words in the book don’t point us toward what Luther considered the actual Word of God – Jesus Christ, the logos – then, per Luther, whatever spirit is moving us isn’t God. Our misspoken words, our wandering attention, our inexpert praise in prayer are the verbal equivalents of printed mistranslations and typographical errors. We’re still talking about something very sacred here. But sacred is not the same as inerrant and unchangeable; sacred is not the same as perfect. Obviously, they didn’t get all of them. Per Wikipedia, which I realize isn’t the most authoritative source, but, like everyone, I quote it whenever I can’t verify information anywhere else, a copy of the Wicked Bible was recently posted for sale online at an asking price of over $89,000. That’s almost three times the fine for misprinting it in the first place. So, hang on to all of Marian’s posts containing typos. You’ll make a killing on Craig’s list, someday. I say the same of any sacred text, ancient or otherwise. Listless religion isn’t a strictly Christian phenomenon, although in the U.S., where it’s still the dominant religion, Christians have the unfortunate luxury of not having to apply ourselves to preserve what we like to think is most sacred to us. A communication technique favored by dictators, demagogues, and TV evangelists since time immemorial.